Fitness starts in your mind. Train it correctly, and your body is sure to follow. At the Maximus Gym in Salt Lake City, Utah, I ask all my clients—whether they're bodybuilders, professional football players, or everyday men and women—to hit a handful of general fitness standards. For example, I expect people to deadlift and back squat double their body weight, row 2,000 meters in less than 7 minutes, and nail 15 pull-ups. One of my clients, Jeff, was obsessed with hitting the double-bodyweight deadlift standard, which for him was 400 pounds. With 390 on the bar, he could fire off two clean reps, so 10 more pounds should have been easy. It wasn't. If I loaded 400 on the bar, Jeff could barely budge it. This pattern continued for several weeks. Jeff would look strong working up to his goal, but the 400-pound bar would cause him to flatline. That's when it became abundantly clear to me that it wasn't Jeff's strength that was holding him back, but his mind. Jeff believed that pulling 400 pounds was going to be one of the hardest things he'd ever do, and so it was. My fix for Jeff was easy: One day, I coached him through the deadlift. We were using bumper plates, and throughout the lifting session I kept mixing and matching and adding and removing plates each set. Eventually, Jeff lost track of how much weight was on the bar. Without knowing it, he casually pulled 405 from the ground with perfect form, but he didn't believe me when I told him he'd just surpassed his goal. He made me recount the weight twice. I told you that to tell you this: Fitness starts in your mind. If you say something is going to be hard, it will be hard. If you say you can't do something, you won't do it. I've seen these kinds of self-limiting beliefs hold back the strength of everyone from average guys to the professional athletes and special forces soldiers I train. These beliefs even held me back. I fought professionally in the UFC, and it wasn't until I got rid of my self-limiting beliefs that I started winning my biggest matches. Unfortunately, the solution isn't as easy as simply trying to think more positively. 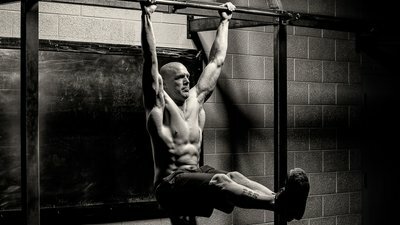 I've developed a handful of specific techniques that can help you hack your psychology to boost your performance. I've laid them all out in my new book, "Maximus Body." "Maximus Body" also dives into the training and nutrition strategies I've used to help average people as well as professional actors get ripped, and pro athletes and soldiers become the fittest they've ever been. It contains over 100 workouts and six months of fitness programming. "Maximus Body" will force you to work harder than you have before—but that's why it works. Here are my two favorite mental hardening techniques, drawn from the book. When it comes to performance, we have two types of thoughts: "red-light" thoughts and "green-light" thoughts. Red-light thoughts are inherently negative thoughts. They set you up to fail. For example, "This will be hard," "I'm not strong enough," "I'll probably fail." These are the thoughts Jeff had before I tricked him into pulling his deadlift max, and the ones I had before the UFC fights I lost. Green-light thoughts, on the other hand, are positive thoughts, which breed success. They sound like this: "I'm going to crush this," "I belong here," "I am capable of this," and "Nobody works harder than I do." The more red-light thoughts you think, the more likely you are to develop a negative self-image—and the more likely you are to fail, according to sports psychologist Brian Cain, who I worked with when I was in the UFC. The more green-light thoughts you think, the more likely you are to succeed. Cain has worked with thousands of athletes and proven, time and again, that green-light thoughts push your performance forward and induce success. Everyone has a balance of the two. No one is immune to self-doubt, but you need to learn to shift your thinking to tip the balance in favor of green-light thoughts. Here's how: Place little green stickers over things you see on a daily basis, like your car's steering wheel, the bathroom mirror, the inside of your fridge, or simply on the weight rack. Every time you see a green dot, tell yourself one reason you're going to succeed and reach your goal. This constant repetition of positive thoughts shifts your thinking, reinforces your confidence, and improves your output, essentially overriding your brain's performance-crushing negativity. Visualization was used heavily by Soviet sports scientists in the 1970s, and it's something a large number of professional athletes and businessmen at the top of their game use today. The main principle of visualization is simple: You take time each day to psychologically rehearse what you want to accomplish, like you're an actor in a movie playing in your mind. Let's say your goal is to deadlift three times your body weight. Mentally picture and rehearse exactly what you need to do to accomplish that. See yourself loading the plates, chalking up, spotting up to the bar, and then taking in air as you hinge back and grab the cold steel barbell. Imagine how all of your muscles feel as you rip the weight from the ground and lock out. The more details you incorporate, the more effective visualization is. Scientists believe visualization works by altering processes in your brain like motor control, attention, perception, planning, and memory, while also enhancing your motivation and confidence so that, when it comes time to perform, your brain is "trained" for the actual performance and success. For visualization to work, however, you need to take it seriously and be fully committed. Every day, you should sit somewhere quiet and close your eyes. Free yourself of all other extraneous thoughts. Take deep breaths and simply think about exactly what you'll need to do to reach your goal—visualize your surroundings and engage all of your senses as you see the performance play out. If you think this sounds weird, ask yourself a question: Could it hurt? Legendary athletes Muhammad Ali, Jack Nicklaus, and Kobe Bryant have all used this technique with great success, and science confirms that visualization has tangible performance enhancing benefits. Consider this study by researchers at The Cleveland Clinic: People who visualized doing a strength training exercise for 15 minutes a day, 5 days a week, for 12 weeks (but didn't actually strength train) still increased their strength by 13.5-35 percent. It's the little things that make the difference between winners and losers. And the little things start in your mind, and lead to success.